Have you ever felt that panic on a Sunday night wishing you had prepared better for the upcoming week? 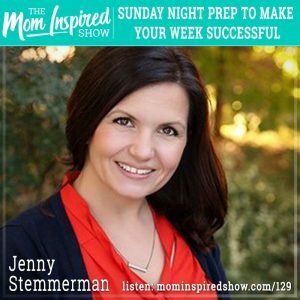 Today we have Jenny Stemmerman on the show and she shares with us some great ideas on setting up our week! Jenny goes over her routines and what works best for her as well as explaining that it shouldn’t all fall on the mom. She highly encourages that weekend prep should be a team sport and everyone participates. One thing that stood out to me is that we should really approach this as a skill and with all skills we don’t master them right away, it gets easier the more you do it. Hear what she says about this topic and more on the podcast.